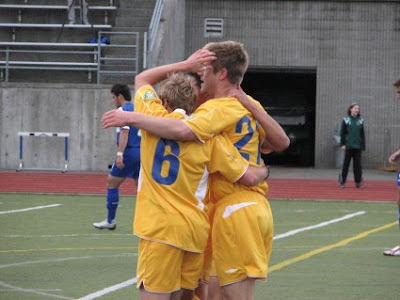 #6 Chase Tangney & #21 Spencer Schomaker each scored twice for TFC. Tangney helps Jordan Jennings earn the shut-out. View our GOALTacoma.com Match Photo Gallery! It was a historic night in Tacoma June 7th as the Tide surfed over the Vancouver Whitecaps Residency (PDL) 4-0, handing the BC outfit their first-ever loss in only their fourth match played. Chase Tangney scored the first and fourth goals for TFC while Spencer Schomaker got the middle two. It was already 3-0 Tacoma in the 23rd minute as the highly-touted Whitecaps lost control of the match at the feet of the pumped-up Tide. The party began just 7 minutes into the match when a ball was half cleared by Vancouver. The flighted ball made it’s way to the edge of the penalty box where Chase Tangney met it with vigor. The right wing struck the ball on a clean volley with his left foot, and from there it was magical. 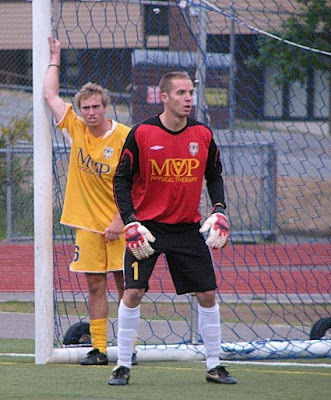 The volley bent passed the Whitecaps keeper into the upper corner of the net. Tangney didn’t stop running until his entire team caught up to him in a mass celebration. It was the type of goal you’d like to see again and again from every angle possible. Read the entire club match report here. Vancouver had many good chances to get on the board but great work in goal by TFC's Jordan Jennings saved the day. The crossbar and post were helpful for Tacoma too, as were several defenders clearing balls off the line and maintaining the blank sheet in the back. The Tide have now out-scored their opponents a whopping 20-1 at Curtis High School this season. Tacoma's record moves to 5-2-1 while the Whitecaps fall to 3-1-0. The Tide's undefeated string at home is now at 15 matches over two seasons.